This is the 1/200 Trumpeter USS Yorktown Battle of Midway #3711. This kit is in excellent as new condition sold as is. Yorktown class of purpose-built US Navy aircraft carriers, three battle stars, lost in the Battle of Midway in June 1942. 1/32 TRUMPETER LOCKHEED P-47D THUNDERBOLT RAZORBACK #02262 2007. INSTRUCTION MANUAL. THE FRUITCAKE RULE. Parts are all sealed in original plastic. Box not included. ---DO NOT USE! BUY IT NOW---. 1/32 TRUMPETER A-4E SKY HAWK 02266 2010. Parts are all sealed in original plastic. Parts included are unused missile lenses, and more. Box not included. You are responsible for these fees and they will NOT be reimbursed. 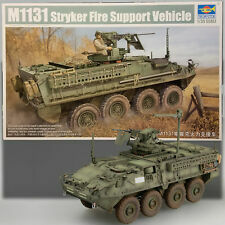 1/35 M1131 STRYKER FIRE SUPPORT VEHICLE. Trumpeter's Stryker FSV Kit features;. Fossileyes' Factoids: Fire Support Vehicle (FSV) of the Stryker series provides automated enhanced surveillance. Protector M151 remote weapon station with M2. 50 caliber machine gun. 1/32 TRUMPETER LOCKHEED P-47D THUNDERBOLT RAZORBACK #02262 2014. Parts are all sealed in original plastic. Box not included. You are responsible for these fees and they will NOT be reimbursed. ---DO NOT USE! Japanese Military "Jeep" style truck. If there is a problem, we will take care of it! Durable and easy to use mini needle file set for fine detail work in 5 unique shapes. Small files are perfect for small and delicate applications. Easy to grip plastic handles provide better control. Great for filing plastic, glass, ceramic, rock, carbide, gold, platinum, silver and other materials. Particularly useful for fine work or within restricted areas. Precise and compact, easy to use. NEW AND SEALED. GERMAN PZ. IT IS BY TRUMPESTER. WILL GET WHAT YOU SEE IN THE PICTURE. The HH65A is a modern US Coast Guard search-and-rescue (SAR) helicopter. The United States Coast Guard has added 96 short range HH-65A helicopters to its fleet to replace the HH-52A Sikorsky Sea Guard. A total of 20 turned brass barrels. Replace the out of round, droopy, plastic, main gun barrels on your kit with these sharp looking brass ones. An internally sealed Trumpeter Model Kit No. 02256 - Grumman F6F-3 Hellcat in 1:32 scale. Good luck. I TRUMPETER ITALIAN PUMA 6X6 PLASTIC MODEL. Condition is New. Shipped with FedEx SmartPost. i will combine shipping if requested! Please see my eBay rating. it is important to me! 1/32 TRUMPETER GRUMMAN F4F-4 WILDCAT #02223 2002. Parts are all sealed in original plastic. BOX NOT INCLUDED! THE FRUITCAKE RULE. ---DO NOT USE! BUY IT NOW---. Trumpeter is an internationally recognized injection molded plastic model kit manufacturer that produces unique subjects of excellent detail and quality. 6 highly detailed 1/700 scale model helicopters. Molded in clear to enable an accurate clear canopy. This finely detailed plastic model kit requires minor assembly and painting. US Navy PB4Y-1 Minicraft 1/72 Complete & Unstarted But Parts Off Trees. The Wellington was the most important British bomber of the initial war period. The prototype first flew in June 1936. Deliveries to RAF bomber squadrons began in 1939. During war period it operated from bases in Great Britain, India, the Middle East, North Africa and Italy. Although fairly modern by its looks, technologically the Wellington was very much a product of an era past. By 1942 slow speed, limited ceiling, and a small bomb load made the Wellington obsolete in the European theatre of operations. Although once it had been supplanted from the E... Availability: Ships in 3 to 5 Business Days. At the onset of the Pacific War in December 1941, the Japanese Navy's A6M Zero fighter was the dominant aircraft successful against the allied air forces. This new version, with folding wings and six wing mounted. 50 caliber machine guns, plus a more powerful 1,200HP Pratt and Whitney R-1830-36 Twin Wasp engine broke the dominance of the Japanese Zero. 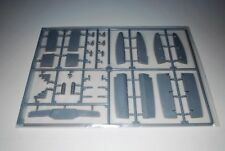 The set contains four 12in (305mm) main gun barrels and twelve 9.4in (240mm) gun barrels for a total of sixteen barrels. Color painting reference and decals for a typical US Marine vehicle. Kit# 3306 ON SALE! LIST PRICE: 36.95 USD. This set provides a nice cross-section of contemporary precision guided air-to-ground missiles used in Operation Desert Storm and later. A total of 22 barrels in the set. Replace the out of round, droopy, plastic, main gun barrels on your kit with these sharp looking brass ones. Muzzles are bored for realistic look.Main guns are drilled to fit the kit trunnion pins. 1:35 Model 00383 SEALED as shown. Once we have had the opportunity to present much of it, we hope you'll agree. Many of the models' boxes include extra paperwork and/or photos with detailed information to help support that particular model within the collection. Kit is in excellent Condition. Trumpeter 04504 1/350 Chinese 132 HeFei destroyer#4504. You get the parts shown in pictures only. Echelon Fine Decal. TAHK / TANK. Tommy's War. Failure to comply with this will result in unpaid item filing. Bob Smith Industries. Master Model. Live Resin. Science Fiction. Trumpeter 1/32 Messerschmitt Me 262 A-1a Model Kit 2235. Condition is New. I will combine shipping if requested! Please see my eBay rating. It is important to me! A total of 9 barrels in the set. Replace the out of round, droopy, plastic, main gun barrels on your kit with these sharp looking brass ones. Muzzles are bored for realistic look.